BELGRADE, Jun 2 2014 (IPS) - Waters have receded in Serbia after the worst flooding the country has seen in 120 years, and something new has surfaced, apart from devastated fields and property – censorship of the internet. A number of sites and blogs that criticised the government’s behaviour at the peak of the floods two weeks ago – in which over 50 people died – were hacked, unavailable or removed, showing the “error 404” message whenever an attempt was made to access them. Some 30 people have been detained in the past two weeks for “dissemination of false news and panic”, in the words of the Public Prosecutor’s Office. Three young men spent nine days in custody for their Facebook posts, which cited hundreds of casualties in the worst hit town of Obrenovac, 33 kms south west from Belgrade. The three were released but will soon face trial. If guilty, they face six months to five years in prison. Sources at the Prosecutor’s Office, who insisted on anonymity, told IPS that “such comments and posts could have caused panic or grave disturbance of public order”, denying that the process represented any type of crawling censorship. 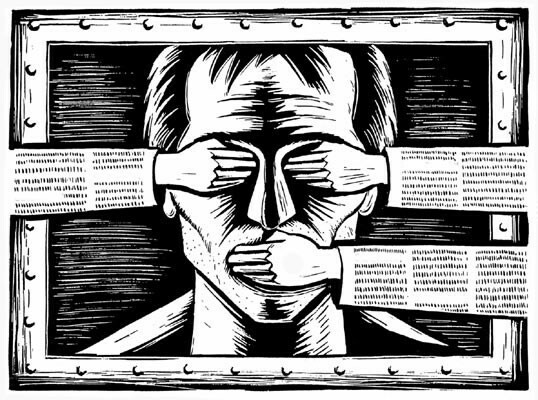 Censorship is banned by the Constitution of Serbia. However, hacking and downing of the Teleprompter.rs and Drugastrana.rs sites that carried highly critical items on Prime Minister Aleksandar Vucic and his government’s behaviour under titles “People are desperate”, “Vucic to stop with pathos and self pity”, “State, we’d won’t keep you any longer” were described as clear censorship by professionals and the Ombudsman of the Republic of Serbia, Sasa Jankovic. A blog on the most popular site which said “I’ AV (Aleksandar Vucic), resign”, was removed without any explanation from the web site of “Blic” newspaper. Axel Springer Media, the owner of the paper, would not comment on the case. One clear case of censorship was the removal of the appeal by Belgrade Mayor Sinisa Mali to citizens of Obrenovac not to leave their homes on Friday, May 16. It was posted on the official site of the Serbian capital of Belgrade, because Obrenovac is one of its city municipalities. It disappeared from the site after the town was completely flooded the same day, when 23,000 people were hastily evacuated. It remained at cache, only to be re-distributed over Facebook and Twitter en masse. Mali is one of the top officials of Serbian Progressive Party (SNS) of Prime Minister Vucic. The SNS won last early general elections in May and run the nation together with Socialists of late strongman Slobodan Milosevic. The coalition has run the country since 2012, when Democrats, who toppled Milosevic in 2000, lost elections due to widespread corruption and inability to save the country from the effects of the global downturn. However, the Prime Minister denied existence of censorship in his recent appearance at state-run Radio-television of Serbia (RTS). “It is absolutely untrue that there was censorship or that there were demands for certain texts or posts to be withdrawn,” Vucic said. He was reacting fiercely to a statement by Dunja Mijatovic, media freedom official of the Organisation for Security and Cooperation in Europe (OSCE). At last week’s OSCE meeting in Stockholm, she expressed deep concern over allegations that websites and online content are being blocked in Serbia. “This is a clear violation of the right to free expression. The Internet provides unparalleled opportunities to support these rights and is essential for the free flow and access to information,” she said. For professionals in Serbia, the behaviour of Vucic does not come as a surprise. In 1999, at the time of NATO bombing, he was part of the Milosevic’s government, the youngest-ever Information Minister. Strict media censorship, together with repressive laws with fines amounting to hundreds of thousands of dollars for independent media marked his time in that position. “It’s the same as in Milosevic’s era, maybe worse” said veteran journalist Jasminka Kocijan. She experienced first-hand the consequences of meddling into state affairs earlier this year. After a widely propagated footage showed Vucic saving a child from snow in the northern town of Feketic, she posted on her Facebook page an item from the Red Cross which described how volunteers really saved people stuck in high snow. She was immediately removed from her editorial post at the state-run Tanjug news agency. Since coming to power in 2012, Vucic and his team have been diligent in efforts to remove all the satirical or even factual online contents dealing with Progressives. A blog on internal issues within the party was removed back then, while online photos or items on Vucic’s second marriage last November were immediately removed. The last incident of the online censorship happened on Sunday evening, when the Pescanik.net web site went down. It carried an analysis of three university professors on the doctor’s thesis by Vucic’s right hand and Minister of Interior Nebojsa Stefanovic. The analysis showed that the thesis was a plagiarism.